© 2019 You Are So Very Beautiful. Betsy Greer (see a more detailed bio here) started this project in 2015 when she began doing the Five-Minute Journal app and found coming up with a daily affirmation was literally the hardest task of her morning. Seriously. It was painful to come with one tiny word that was good. So she began to stitch the affirmations she needed to hear in order to let them really, truly sink in. This, too, was hard at first. Decades of depression and trauma and whatnot don’t disappear easy. But in making them, she realized that she probably wasn’t the only one who also needed to hear these messages. Inspired by Sayraphim Lothian‘s idea of guerrilla kindness (you can see more examples here or read an essay about it in Craftivism: The Art of Craft and Activism), she started putting the signs out for people to find. Since then coordinated drops (where people have collected signs and set them around town en masse) have been done in Baltimore , Maryland (with Mary England); Vancouver, Canada (by a group led by Monica Miller); London, England (by a group led by Catherine West); Melbourne, Australia (by a group led by Sayraphim Lothian, images here); North Carolina State University’s College of Design (as part of Katherine Diuguid‘s class) and Durham, NC (by a group led by Betsy). Signs have been left all over the world by individuals all over the world. Check some out here or over on Instagram at #yasvb. 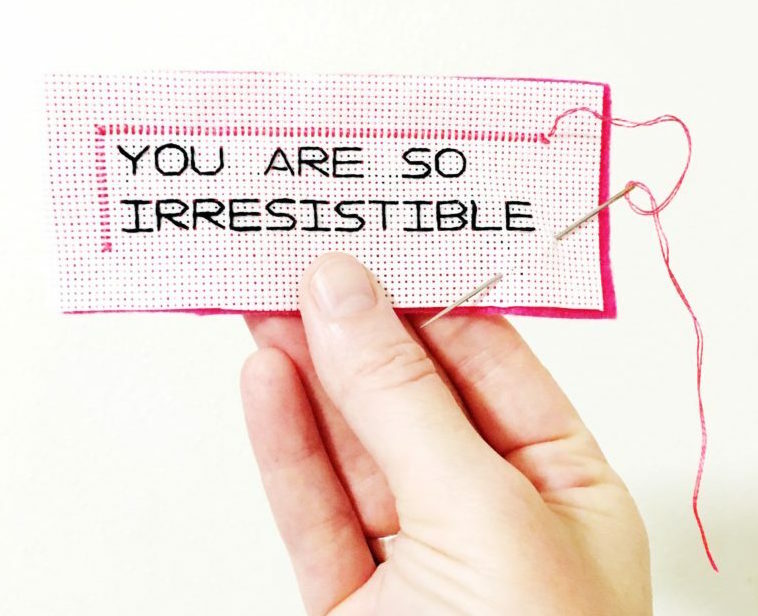 In 2016, dozens of stitched signs were displayed at the Fuller Craft Museum in the CounterCraft: Voices of the Indie Craft Community exhibition curated by Faythe Levine. In 2017, YASVB was a part of Mr. X Stitch‘s Inspiration Station at the Knitting & Stitching Show in London, England, and received lots of workshop help from first-year students at the Royal School of Needlework! Betsy has given talks on the project, led workshops and helped people coordinate their own drops and would love to work with you on a related idea if you have one! Please get in touch!